Mount Kinabalu is the place where you could see breathtaking sunrise from above the clouds, 13,435 feet or 4095 meters above sea level. It is the highest mountain in south-east asia and offers a unique climb from tropical luxuriance through montane oak forest to the rocky sub-alpine summit plateau. 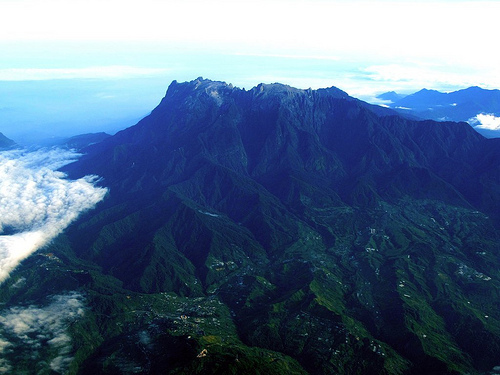 Mt Kinabalu is in Kinabalu National Park in the Malaysian state of Sabah on the island of Borneo. Sabah's capital city, Kota Kinabalu, is about 90 minutes by air from Malaysia's capital, Kuala Lumpur. Kinabalu is the tallest peak in Borneo's Crocker Range and is the fourth tallest mountain in the Malay Archipelago after Papua's Puncak Jaya, Puncak Trikora and Puncak Mandala. The mountain has been designated as a Centre of Plant Diversity for Southeast Asia and is exceptionally rich in species with examples of flora from the Himalayas, China, Australia, Malaysia, as well as pan-tropical flora. It has a very wide range of habitats, from rich tropical lowland and hill rainforest to tropical mountain forest, sub-alpine forest and scrub on the higher elevations. 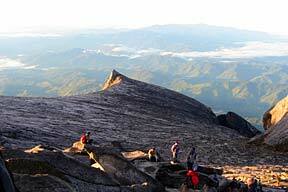 If you're feeling up to a hike to the third tallest mountain in Southeast Asia, Malaysia's Mount Kinabalu is open to all comers. Kinabalu Park is about fifty miles east of the city of Kota Kinabalu, and can be reached in two hours via bus ride from this city. 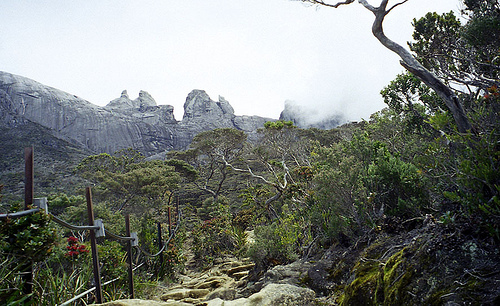 If you're coming from Sandakan, a bus ride to Mount Kinabalu will take six hours.